Contributing to the Rise in Cases: Heavier Children, Lower Cribs, Older New Mothers, and Frequent Smartphone Scrolling. Tara Heglar was picking up her son from his crib when the pain started, a searing sharpness on the side of her right hand. It began when Charlie was about a month old and continued to worsen over the next half year. The snap of pain would return when she used her iPhone, lifted her son or even cradled his head while he nursed. “It felt like I had bruised my bone,” says the 38-year-old Ms. Heglar, a business analyst in Concord, N.C.
An orthopedic surgeon diagnosed Ms. Heglar with mommy thumb, formally known as De Quervain’s tendinitis, an inflammation of the tendons below the thumb down to the wrist. Although the condition has been around as long as parents have hoisted their children, doctors say a combination of heavier children, older new mothers, cribs that are lower to the floor and frequent scrolling and typing on smartphones has sent the number of cases skyward. Orthopedic surgeons estimate that between one-quarter and one-half of new mothers experience symptoms of De Quervain’s. When common pain relievers don’t ease the inflammation, patients are getting steroid injections, splints and even surgery. Ms. Heglar says she wore a splint after getting a cortisone shot and hasn’t had problems since. 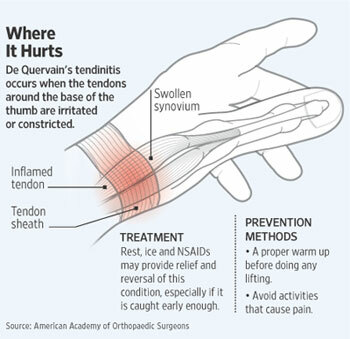 People with De Quervain’s typically experience pain on the thumb side of the wrist that radiates up the forearm. Sometimes the symptoms start during pregnancy. Doctors aren’t sure why, but they believe that swelling adds pressure to already stressed tendons, exacerbating the irritation. For many women (and some men), it gets worse when they are constantly lifting a child, bending down into the crib, putting their hands in an “L” shape under the child’s armpits and lifting so that much of the weight is on the thumbs. In a study published last year that looked at more than 11,000 cases of De Quervain’s culled from a large data base of military personnel, researchers at the University of Colorado School of Medicine found that the condition occurred more than four times as frequently in women as in men. The study also found that people over 40 years old were more than three times as likely to get De Quervain’s as younger people. Rachel Rohde, an orthopedic surgeon in Royal Oak, Mich., says most of her patients with De Quervain’s are mothers, but she also sees some fathers, grandparents and nannies with the condition. As the mother of a newborn herself, Dr. Rohde said she’s careful to put a pillow under the baby’s head while nursing so the weight of the baby is not resting solely on her hand and straining her thumb. She also says she tries to use a “scooping” technique to lift the baby out of the crib. By placing the weight in the palms or on the forearms, it avoids putting the thumb out of alignment to the rest of the hand and stressing the tendons, she says. Still, Dr. Rohde says, the automatic motion for picking up a baby is usually to lift from under the baby’s arms, which places the strain on the thumb. “Sometimes you can’t avoid it,” she says. Children are getting heavier, on average. In 2004, 10.1% of children aged 6 months to 2 years were overweight, compared with 5.7% in 1980, according to the most recent data from the Centers for Disease Control and Prevention. Katy Lawson, 29, of Lantana, Texas, says she never had problems with her hands until her son was about a month old. She began noticing sharp pains down her hand when she tried to lift him or grip something, and a bump was forming on her wrist. Although Ms. Lawson’s son is not particularly heavy, she says he often sleeps in a portable playpen that is low to the ground. Many cribs also are now lower to the floor for safety reasons, and doctors say that creates more stress on the hand when lifting a baby. Two months later, Ms. Lawson says she went to see a hand surgeon. 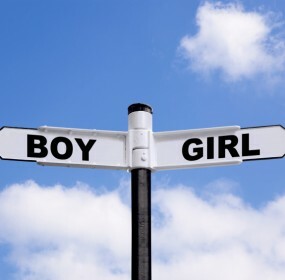 When he asked if there was a new baby in the house, she said, “It’s funny that you mention that.” She says she has received two cortisone shots on the wrist, beneath her thumb. She was also given a splint to wear for a few weeks. The treatment hasn’t helped, and Ms. Lawson says she is scheduled for surgery this month. She says her thumb doesn’t hurt as much when she picks up her son, because she is careful about she lifts him. “It just hurts randomly. Sometimes when I’m just lying in bed it catches,” she says. Mommy thumb mainly affects two tendons—the abductor pollicis longus, or long thumb abductor, and the extensor pollicis brevis, or short thumb extensor. The tendons come into play when the thumb is moved in a different plane from the hand, as when placing hands flat on a table and lifting the thumb toward the ceiling. 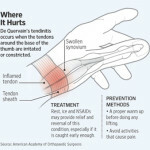 If ice and anti-inflammatory drugs don’t help, most patients are fitted with a splint that prevents them from moving the thumb and given a steroid injection, which decreases the inflammation, says Stephen Troum, a hand surgeon in Bedford, Texas, and a spokesman for the American Society for Surgery of the Hand, a doctors’ association. Dr. Troum, who treated Ms. Lawson, himself had hand surgery for De Quervain’s when he was a resident after aggravating his wrist doing a lot of surgery. He says that if patients don’t feel relief after one or two steroid shots, he usually recommends surgery. Too many injections can weaken the tendons to the point of rupture, he says. Michelle G. Carlson, a hand surgeon at the Hospital for Special Surgery in New York City, developed De Quervain’s herself after giving birth. “I thought I was really cautious, but when I had my first child, I started feeling sore and I made myself a splint right away,” she says. She says mommy thumb is the main reason she sees De Quervain’s patients, although others can develop it from tasks that repeatedly stress the tendons around the thumb. “A lot of people will say, ‘Oh my child is so heavy,’ ” Dr. Carlson says. Heavier children tend to start walking later so mothers are doing a lot more lifting for a longer time. “You don’t see this develop when the child is 3 and they’re walking on their own,” she says.